What to expect from a meteorological conference in one of the smallest countries in the southeastern part of Europe? That’s a question I asked myself when I was invited to the 6th edition of “Challenges in Meteorology” (in Croatian: Meteorološki izazovi 6, or MI6). How would it compare to its big brothers such as “DACH” run by German speaking countries or the UK’s RMetS equivalent? The answer is that it compares quite well, since the organisers included an impressively diverse list of talks and posters into the two-day event programme. In part, it is Croatia’s diverse climate that provides for this diversity; crop-destroying drought and hail, tree-smashing freezing rain and traffic-perturbing winds were all on the menu. Croatia has taken on these meteorological challenges. With assistance from the EU, its network of meteorological stations has been completely refurbished. By 2021, a significantly enhanced network of 6 cutting-edge Dual-Pol RADAR stations will finally cover the entire country, filling one of the few blind spots on the radar map of Europe near the Adriatic coast. Another talk reported how the latest satellite technology is used to survey and remove dying trees to limit further damage. In another, model studies showed what challenges lie ahead in terms of precipitation or drought extremes, and how the country’s vegetation is responding to the recent changes in climate. And of course, the latest NWP models are used to give more reliable forecasts and nowcasts to make air travel safer. On a related topic, LIDARs are being used to analyse the unique bora wind features that can make landing a plane in Dubrovnik a hazardous endeavour. 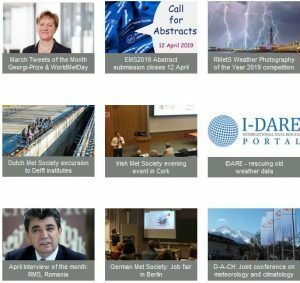 Besides the scientists of Croatia’s Meteorological and Hydrological Service, academic researchers and air controllers, the programme included a selection of invited speakers from neighbouring countries and expatriates currently working abroad. This resulted in a healthy mix of presentations in English and Croatian and provided plenty of ideas for intense discussions and further collaboration. Have you heard of meteotsunamis? Have you ever wondered how to model the clothing required depending on the weather and a person’s body mass? You can expect insights on such interesting topics if you fancy a visit to the next conference, MI7, which will take place in spring 2020.